Fridays these days tend to offer a lot of excitement. Fridays have become my favorite workout day: on Fridays, I do low intensity cardio intended to burn fat followed by abdominal work. When I began my journey to become more physically fit, I weighed 244 lbs, my highest recorded weight. Graduate school and other stresses saw me pressed for time, commuting almost three hours total every day, living on donuts, iced coffee with cream and sugar, and Auntie Anne’s pretzels at Philadelphia’s 30th street station. It didn’t help that my new house was directly behind Wendy’s, either. While there is much debate over the effectiveness of low intensity cardio, at the very least it helped ease me back into a healthier life style and into more intense workouts that I was used to. When I noticed it took me an hour walking at a moderate pace to burn 600 calories and that an Auntie Anne’s cinnamon sugar pretzel was 470 calories with 7 grams of saturated fat, I realized there were two ways to obtain a calorie deficit: make smarter choices coupled with exercising or maintain my unhealthy choices and have to work twice as hard to see results. Long story short, through my journey, I’ve seen the most progress in my waist-line. I’ve lost 38 lbs. in a little over 6 months and now am actually looking to put back on a couple of those pounds in the form of muscle. When the packaging is this intense, the product HAS to work. In addition to smarter nutrition, I have added a supplement or three into my diet. I consume a daily vitamin as well as 3,000 mg of fish oil. I have added to my breakfast and post-workout protein shakes. In early July, I added a pre-workout NO supplementary shake called Shock Therapy by Universal Nutrition, the company who sells the notoriously difficult to consume, 20+ pill Animal Pak daily multi-vitamins. Thankfully, this is a little easier to consume. It is a powder that you mix with 8-12 oz. of water and it tastes pretty delicious actually. I would compare it to Hawaiian Punch, only a little less sweet. It’s got a lot of Vitamins C, B6, and B12 and some other funky stuff that promises nitric oxide boosts (the stuff that widens your blood vessels and increases blood flow, give you extra blood flow to the muscles while exercising), antioxidants, and increased focus, drive, and gym intensity. Among other things, it has a moderate level of caffeine. The packaging suggests consumption within 30 minutes of working out. The gym is about 10 minutes away, so I usually mix it up before I leave, sync the iPod, and head out. I did something different today, though. For lunch, I had a large iced coffee with extra skim milk and no sugar and a whole wheat bagel, a really light lunch. For breakfast, I had only a protein shake, made with water instead of my usual skim milk, 2 scoops of whey protein, a banana, and some blueberries. Again, very light. I didn’t think very much as I downed my pre-workout mix about 15 minutes after I finished my large iced coffee. As I was driving to the gym, I started shaking and sweating and decided to pull over in the nearby Big Lots parking lot. When I realized that I stacked a LARGE amount of caffeine really close together accidentally, I quickly downed my entire 20 oz BPH-free water bottle and, no joke, turned on some easy listening music rather than the Pat Travers that I had been listening to to reduce my heart rate. I closed my eyes, took a few hundred deep breaths, and walked around Big Lots for a bit while I got my barrings again enough to drive safely to the gym. Believe it or not, this is not the first time I have had such a reaction to caffeine. In my younger, and less nutrition-based days, aka November 2008, Pepsi Max came out as the end all, be all diet soda. I tried it once in its 20 oz. form and liked it a lot. When I found 2 liter bottles at Wholesale Liquidators in Manhattan for $.50 each, I got as many as I could safely carry down Broadway to 80 Lafayette at one time, which turned out to be 10. Rock Band 2 had just come out for Playstation 3 and I was addicted to it. The Phillies just won the World Series, the stress of the election was over, midterms were over, fall baseball was over, and I had the coolest, newest video game out there. On a Friday, being the awesomely fun guy that I am, I decided I was going to stay up until 1 AM that night playing Rock Band 2 and try to beat a sizable chunk of the career mode. I had some pretzels, Doritos, and 10 bottles of this new Pepsi Max. Not knowing the controversy surrounding diet sodas, and having no clue exactly how much caffeine was in this soda, I was up until 6 AM that morning. And I had only drank about 3/4 to 4/5 of a 2 liter bottle. The worst part was, I actually tried to go to sleep at 1 AM, but just couldn’t. I ended up Googling “How to flush caffeine out of your body”, drinking tons of water, and trying to walk it off by walking to the deli. That episode taught me that either my caffeine tolerance is pretty low or there is a gigantic amount of caffeine in Pepsi Max. After today’s episode, the truth probably lies somewhere firm in the middle. 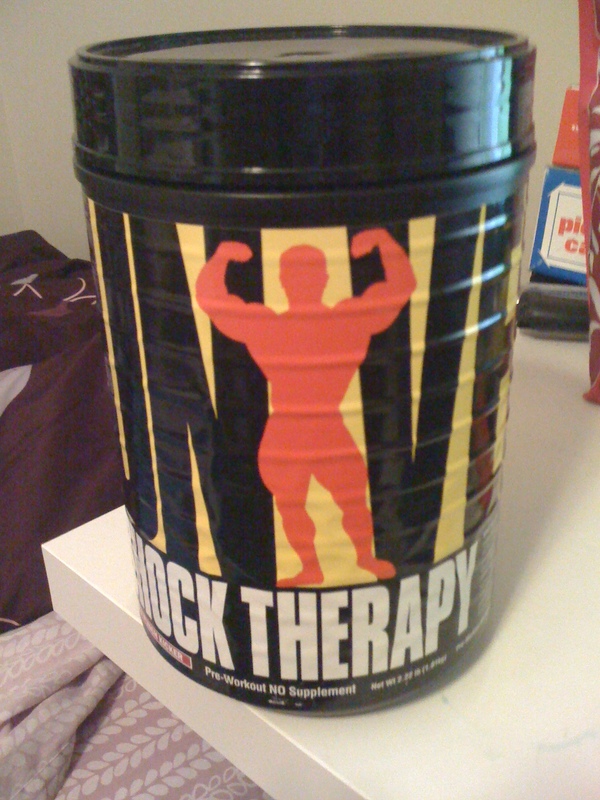 I can say without a doubt that the Shock Therapy NO pre-workout supplement has increased the intensity of my workouts, as well as the quality. When I take this product without consuming other caffeinated substances, it does give me a little bit of an energetic boost, but it is definitely not what happened today. I cannot say the same about Pepsi Max. There is entirely way too much caffeine in that product and that experience, coupled with the negative effects of soda as a whole, has really pushed me away from those artificially colored, flavored, and sweetened carbonated beverages. I’ll stick to unsweetened iced tea, thank you! Aside from consuming two products high in caffeine too close together time wise and Roy Oswalt’s unfortunate Phillies’ debut, today was a pretty great day. I’m headed to Oakland, NJ to see the girl of my dreams tomorrow for Health and Fitness Day 2010, as we’ve been calling it. I love sharing so many things with Sarah and it is really amazing how supportive she is, particularly of my pursuit of health. Tomorrow’s tentative itinerary includes some running on a track, a hike, a trip to Whole Foods, and some cooking. Can’t wait! Next ›The triceratops, proper, didn’t exist?